YEKATERINBURG, Russia (AP) — Vladimir Putin`s victory in Russia`s presidential election Sunday isn`t in doubt. The only real question is whether voters will turn out in big enough numbers to hand him a convincing mandate for his fourth term — and many Russians are facing intense pressure to do so. "The program that I propose for the country is the right one," he said. 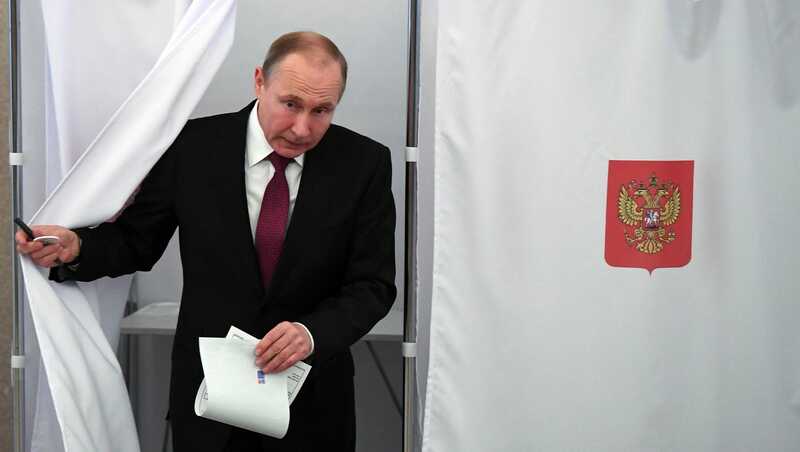 Election monitors were reporting irregularities at voting stations across Russia, even though election authorities were under orders to ensure that the voting was free and fair after violations marred Putin`s last election in 2012. Back then, Putin faced a serious opposition movement, but since then he has boosted his popularity thanks to Russian actions in Ukraine and Syria. Now, he faces seven challengers but no serious threat to his rule. Voters were casting ballots across the world`s largest country, from the Pacific coast to Siberia and Moscow. Voting will conclude at 8 p.
EDT) in Kaliningrad, the Baltic exclave that is Russia`s westernmost region, and initial results are expected soon afterward. Election monitoring group Golos and online groups set up to record violations reported scores of problems Sunday. They included discrepancies in ballot numbers, ballot boxes placed out of sight of observation cameras and last-minute voter registration changes likely designed to boost turnout. The central election commission released midway turnout figures for far eastern and Siberian regions ranging from 28 to 100 percent. But the figures meant little because the population is heavily concentrated farther West in European Russia. Some 145,000 observers were monitoring the voting in the world`s largest country, including 1,500 foreigners and representatives from opposition leader Alexei Navalny`s political movement. Navalny himself is barred from running. "But the answer was easy . If I want to keep working, I vote," he said. He said his bosses haven`t asked for proof of voting but he fears they will. He spoke on condition that his last name not be used out of concern that his employer — the Moscow city government — would find out. Yevgeny Roizman, the mayor of Russia`s fourth-largest city, Yekaterinburg, told The Associated Press that local officials and state employees have all received orders "from higher up" to make sure the presidential vote turnout is over 60 percent. A doctor at one of the city`s hospitals told the AP how one kind of voting pressure works. "People were indignant at first, said: `They`re violating our rights` . but what can you do?" she said at a cafe Saturday. Yekaterina said she wasn`t sure what she would do with her ballot, musing that "maybe I`ll just write `Putin is a moron. `" But she understood that not showing up at the polling place Sunday would not only endanger her job but would reflect badly on her boss, whom she likes. She said she wouldn`t go to vote if she wasn`t forced to. "What`s the point? We already know the outcome. This is just a circus show," she said. Authorities were also appealing to patriotic feelings by holding the vote on the anniversary of Russia`s 2014 annexation of Crimea from Ukraine. Polls show that most Russians continue to see the takeover of that Black Sea peninsula as a major achievement despite subsequent Western sanctions. Voters also faced billboards celebrating Russian greatness — a big theme of Putin`s leadership. authorities investigate alleged Russian interference in President Donald Trump`s 2016 election, Moscow has warned of possible meddling in the Russian vote. Turnout-boosting efforts have been the most visible feature of the campaign — and all come from taxpayers` pockets. In Moscow alone, authorities spent 50 million rubles ($870,000) on balloons and festive decorations at polling stations. Voters who take selfies at polling stations and post them under the designated hashtag will be able to enter a raffle for high-end electronics, including an iPhone X.
Ella Pamfilova, the chairwoman of the Central Election Commission who was appointed to clean up Russia`s electoral system, vowed to respond to complaints about being coerced to vote. Putin has traveled across Russia pledging to raise wages, pour more funds into the country`s crumbling health care and education and modernize dilapidated infrastructure. Among Putin`s challengers is Ksenia Sobchak, a 36-year-old TV host who has campaigned on a liberal platform and criticized Putin`s policies. Some see Sobchak, the daughter of Putin`s one-time patron, as a Kremlin project intended to add a democratic veneer to the vote and help split the ranks of Kremlin critics. Read or Share this story: https://usat.